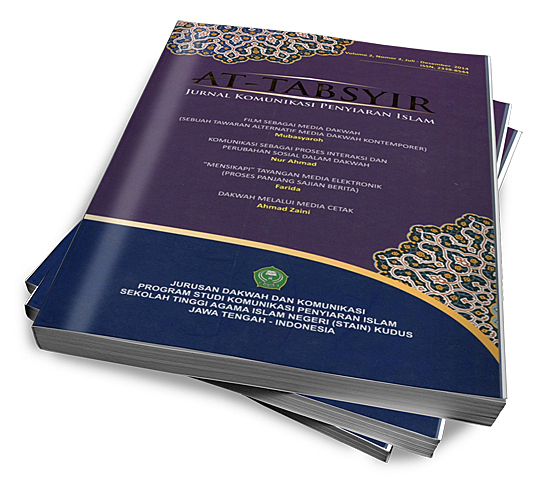 AT-TABSYIR: Journal of Islamic Broadcasting Communication (p-ISSN: 2338-8544 e-ISSN: 2477-2046) is a journal that contains actual issues related to Islamic, communication and social dakwah generated by academics through various literature review (Library research) or field study to be published in the form of Scientific Journal. The AT-TABSYIR Journal is published twice a year (every six months, published in June and December) by the Communication Studies Program of Islamic Broadcasting Department of Da'wah and Communication STAIN Kudus. Vision: to be a scientific journal of communication and broadcasting of Islamic quality and quality. Mission: presents the results of studies in the field of communication and broadcasting of Islam for the sake of education, research and community service. Objective: to improve the means of information and public literacy in the field of communication and broadcasting of Islam in the global era. AT-TABSYIR Journal of Islamic Broadcasting Communication is a Journal which contains actual issues related to Islamic, communication and social dakwah generated by academicians through various library research or field study to be published in the form of Scientific Journal. AT-TABSYIR The Journal of Islamic Broadcasting Communications is a Journal containing actual issues relating to Islamic, communication and social preaching produced by academics through library research or field study to be published in the form of Scientific Journals.